A lovely day in the low country. 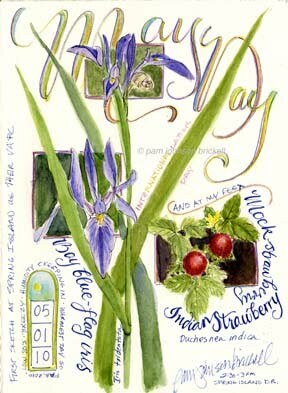 I spied these blue-flag iris and had to stop and sketch them. The surprise was finding mock strawberries at my feet :) They were quite a good size and it puzzled me at the wild strawberries I'm used to were teeny. My wildflower guide cleared up the mystery. These plants were actually introduced from India and are not part of the strawberry family. It goes on to say that the fruits appear edible but are actually flat and tasteless. I'm glad I didn't try one. I would have been really bummed. I painted the flowers plein air then added the calligraphy at home. Sweet page, Pam! Love the berries even if they are "mock!" Nice may day artwork! Really nice! Feels like spring is really here in that poster alone. I like the collage feel to it. there is nothing better than a sketch book full of illustrations and calligraphy! the combination of the two talents is breathtaking! 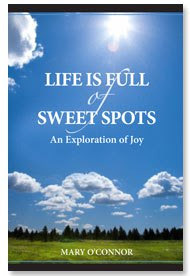 what a delight to flip through your pages/posts....and delve into the artsy fartsy realm! thanks for doing what you do, and for sharing it! now, on with the coffee!!!!! Thank you so, Carmelina! I'm blushing :) I look forward to your return visits! Thank you, Leslie, and also for stopping by!